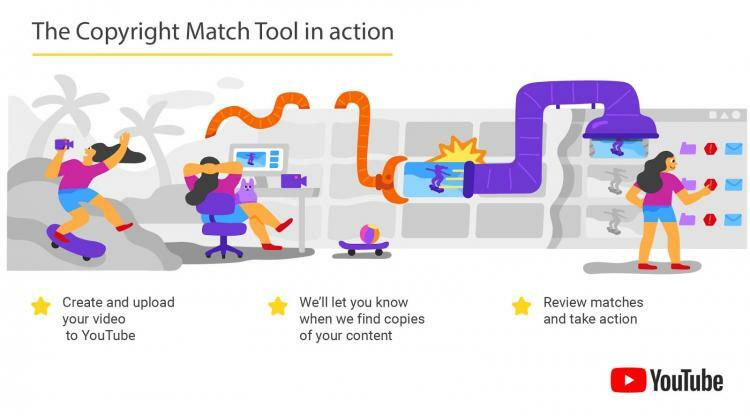 YouTube introduces the Copyright Match tool in an effort to further assist content creators in protecting their content. The new tool will be added to YouTube’s existing tools that help protect content and its owners. The Copyright Match tool is designed to locate re-uploads of your content on the vast library of videos in YouTube. Using this tool is simple and straightforward, once a user uploads a video on YouTube, the tool will scan other videos on YouTube which have a similar content. Once a match is located, results will appear in the ‘matches’ tab of the tool and users can decide what to do next. The Copyright Match tool has been tested with creators close to a year and is deemed effective and safe to use. YouTube still emphasizes the importance of being the first user to upload any content. The time of upload will be used to determine the ownership of the copyright and who would see the matches in the future. The Copyright Match tool is created to find full re-uploads of videos, if a user finds a clip of his own content on other videos and want it removed, the user can report a copyright claim and submit a takedown request here. Once the tool finds a match, users have multiple options available. Users can either do nothing, contact the other creator, or request YouTube to take down the video. Takedown requests are reviewed by YouTube to ensure it complies with copyright policies. YouTube will be rolling out an update that will make the Copyright Match tool available to creators with more than 100K subscribers. Hence, YouTube will push a long-term goal of making the tool available to every creator in the YouTube Partner Program.